.............. but it has a rendezvous with destiny...."
olonel William C Lee was given command of all airborne units in March 1942. This new organization was designated the Airborne Command and established at Fort Benning GA. Rapidly moving world events accelerated the need for trained airborne units and two more parachute regiments were activated. On 20 July 1942 the 506th Parachute Infantry Regiment was activated and Lt Col Robert F Sink was named regimental commander. Lt Col Sink, who had been a member of the original 501st Parachute Infantry Battalion relinquished his command of the 503rd PIR to Lt Col Kenneth Kinsler and immediately began the task of thoroughly conditioning his new recruits. Like many of the Airborne regimental commanders of his day, Col "Bounding Bob" Sink instilled his own unique style of leadership on his troops who took their training camp reviews on the double. Besides setting a world record, this demanding style of training would serve the men well during the war when they were renowned for marching great distances in short periods of time. This training took place in Camp Toccoa, Georgia which was adjacent to the Currahee Mountains. Ironically, "Currahee" meant "stand alone" in the local Indian language and the troopers immediately adopted it as their regimental motto since that was their objective behind enemy lines. 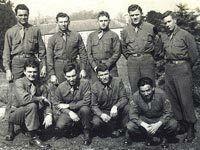 Toward the end of November 1942, the 506th PIR was ordered to Fort Benning for parachute training. Upon arrival at Fort Benning, the 506th immediately started their parachute training. They learned to pack their own chutes and to prepare their equipment to be dropped in an airborne operation. Once their advanced airborne training at Fort Benning was completed, the unit moved to Camp Mackall, NC. It was here that extensive tactical training was conducted, including many night jumps. The 506th PIR was attached to the 101st Airborne Division on 1 June 1943. Later that month the regiment moved west to participate in the Tennessee maneuvers. After participating in the maneuvers, the 506th moved to Fort Bragg, NC until the end of August 1943 when the unit reported to Camp Shanks, NY to prepare to be transported overseas. The 506th crossed the Atlantic on the S.S. Samaria during September, arriving at Liverpool, England, on 15 September 1943. In England, the 506th was stationed in Wiltshire County, with units in such villages as Aldbourne, Ramsbury, Froxfield, and Chilton-Foliat. Here the unit took part in such exercises as "Operations Wadham and Rankin" in preparation for the coming invasion of occupied Europe. June 5, 1944, found the men of the 506th parked by the aircraft that were to carry them into their first combat mission. The 506th PIR took off for their first combat jump at 0100hrs, 6 June 1944. In the predawn hours of D-Day a combination of low clouds, and enemy anti-aircraft fire caused the break-up of the troop carrier formations. The scattering of the air armada was such that only nine of the eighty-one planes scheduled to drop their men on the Drop Zone (DZ) found their mark. Consequently, the sporadic jump patterns caused most of the troopers to land far afield of their designated DZ. Some of the sticks landed as far away as 20 miles from the designated area. Only the 3rd Battalion landed in close proximity to their designated DZ. However, the area had long been recognized by the Germans as a likely spot for a parachute assault. The Germans set a strategic trap and in less than 10 minutes managed to kill the battalion commander, Lt Col Wolverton, his executive officer Maj George Grant and a large portion of the battalion. The only part of the battalion that survived were those who were dropped in the wrong DZ. These two planeloads of troopers under the leadership of Capt Charles Shettle managed to accomplish the battalion's objective of capturing the two bridges over the Douve River. The men of the remaining battalions fought valiantly in small groups, and as others joined them, they moved towards their objectives. Just prior to the landing of seaborne forces, the high ground overlooking the beaches was seized and held by the men of the 506th Parachute Infantry Regiment. On 29 June the 101st was relieved from the VIII Corps and sent to Cherbourg to relieve the 4th Infantry Division. The 506th PIR remained as a First Army reserve until 10 July, when it returned to England for rest and training. At about the same time General Eisenhower called for a headquarters that would oversee the Allies' airborne troops. In August 1944 he established the First Allied Airborne Army, controlling elements of the American and British (and Polish) Armies. The new army was put to the test in September 1944 during the Allied thrust in northern Europe: Operation Market-Garden. This was an audacious plan concocted by British Field Marshal Montgomery (picture left) that would be the first major daylight air assault attempted by a military power since Germany's attack on Crete. Similar to the Germans assault of four years earlier, the Allies initial plan for September 17,1944 was to use the paratroopers and glidermen of the 82nd and 101st U.S. Airborne Divisions and England's First Airborne Division in a daring daylight drop into Holland. The airborne Allied troops were to seize roads, bridges and the key communication cities of Eindhoven, Nijmegen and Arnhem, thus cutting Holland in half and clearing a corridor for British armoured and motorized columns all the way to the German border. The 101st mission was to secure the fifteen miles of Hell's Highway stretching from Eindhoven north to Veghel. After less than three months in England, the 506th was to make its second combat jump. This time the unit was to land in Holland on DZ B, seize the Wilhemina Canal Bridges at Zon, then move South and take Eindhoven with its four highway bridges over the Dommel River. Shortly after 1315 hours on the afternoon of 17 September 1944, the entire regiment landed on one field, and the unit pushed south to Zon with little difficulty. Upon arriving at Zon, the 1st Battalion, led by Maj James L LaPrade, found the two bridges had been blown when the leading group was within 50 yards of securing it. Undaunted by this setback, Col Sink ferried his Five-O-Sink troopers across the canal, however, the regiment was a day late in arriving at its objective, Eindhoven. By noon on D plus 1, the Eindhoven bridges were secured, and at 1830 hours, the British were able to move an armored unit into the town. From D-Day until November, 1944, the men of the 506th became familiar with such names as St Oedenrode, Uden, Veghel, Koevering, Nijmegen, Opheusden and Randwijk, as they fought from town to town and repelled every counter-attack the enemy launched. The end of November found the unit at a former French artillery garrison just outside the village of Mourmelon. Here they rested, reorganized and received replacements. On 16 December, 1944, The Germans had launched a major offensive at dawn on 16 December, west through the Ardennes Forest, in the lightly held sector of our VII Corps. At that time Shaef's Reserve consisted of the 101st and 82nd Airborne Divisions. The 101st was ordered to the vitally important town of Bastogne which was the key to the German counteroffensive. From Bastogne radiated several roads that were essential to the German juggernaut. The 101st was jammed into trucks for an overnight rush to Bastogne in Belgium on Dec. 18th. The defense of Bastogne by the 101st presented a formidable obstacle to the surging Fifth Panzer Army of Hasso von Manteuffel (picture left). In the ensuing days the encircled Currahees and for that matter the entire 101st engaged in vicious fighting. The Screaming Eagles suffered heavy casualties including the Currahees highly regarded 1st Battalion Commander, Lt Col James L LaPrade, as the 506th defended Bastogne on the eastern sector of the circular airhead established by General McAuliffe. Like their "brothers" in the other units the 506th fought with what they had and prayed that the C-47s would get through with the vital supplies necessary to sustain them. Finally, on December 26th Patton's 4th Armor Division broke through the encirclement and the lifting of the siege of Bastogne began. On 15 January 1945, the 506th Parachute Infantry Regiment took the town of Noville, Belgium, a longtime Division objective. Then on the 20th of January, the 506th moved to the Alsace Province of France where Hitler's "Operation Nordwind" offensive, under the personal direction of Heinrich Himmler, was threatening a sector of the Seventh Army front. While holding the line the regiment changed positions several times while also sending out many patrols. Although the enemy continually shelled their positions, the 506th PIR did not conduct any major operations during this time. On 23 February, the men of the 506th were relieved, and returned to Mourmelon, France. Here General Eisenhower spoke to the 101st Airborne Division when the unit was awarded the Distinguished Unit Citation for its stand at Bastogne. This was the first time in the history of the United States Amy that an entire Division had been so honored. As the war in Europe was nearing its end,the 506th moved to the Ruhr Pocket on 2 April to help in mop-up operations. Here the 506th went on the line facing the Rhine River south of Dusseldorf, Germany. On the 4th and 5th of May, the 506th received and carried out its final wartime mission - the capture of Berchtesgaden, Hitler's Eagles Nest. On 8 May, Colonel "Bounding Bob" Sink accepted the surrender of the German LXXXII Corps, commanded by Lt General Theodor Tolsdorf. The 506th established its command post in Zell Am See, where it remained until the end of July, when it moved to Joigny, France. On 30 November 1945 the regiment was deactivated, and its few remaining members were reassigned to other units. E Company - 506 PIR - Photo of Sgt D. Malarkey, Sgt Burr Smith & Sgt W "Skip" Muck (KIA) of E Company - 2nd Platoon - the 506th PIR at Ft Benning, GA.
E Company - 506 PIR - Photo of members of E Company - 2nd Platoon - the 506th PIR. G Company - 506 PIR - Western Union Telegram - Informing of 1/Sgt Woodrow H Smith's capture. G Company - 506 PIR - Miscellaneous photos - 1/Sgt Woodrow H Smith.